There are really only two things to write about on a food blog the day after Thanksgiving. One is using up leftovers, and the other is your holiday gift guide (isn’t this one nice?). Since buying things isn’t my strong suit (except for groceries, of course, where I excel beyond all necessity), I guess I’d better give you an idea for using up some of those tuppies in the fridge. I roasted my broccoli especially for this recipe, but I am going to give you license, as always, to substitute. Have leftover green beans, Brussels sprouts, cabbage, cooked greens? Any of those would be great here. You could even, I am confident, use an orange vegetable instead, or a combination. The important thing is to lay a solid foundation of veggies, tofu, and grains to soak up this garlicky delicious lemon-harissa sauce, adapted from Heidi Swanson’s Super Natural Every Day (it’s also the star of this ravioli salad with greens and feta). As I write out the recipe, it looks like a lot of work, but it’s not really. Make rice, roast veggies, make a sauce, toast crunchy seeds. And if you have leftover vegetables, you’re ahead of the game—as if we need another reason to be thankful for leftovers. How was your Thanksgiving? And how’s the leftover situation? Feel free to leave links, as always, to your favorite leftover-user-upper recipes in the comments! 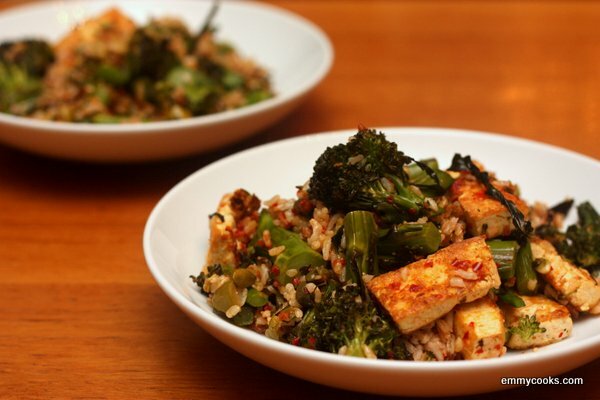 Roasted Broccoli and Tofu Rice Bowl: First, prepare all your bits and pieces. Start a pot of rice if you need to, but leftover rice is even better (I used a mix of white, red, and brown). Roast broccoli if you don’t have leftover green vegetables. Rub 1 lb. broccoli florets and chopped stems with 1 Tbsp olive oil and a sprinkle of salt. Roast at 450, turning occasionally, until the leaves and edges are crisped to your liking. Make a garlicky lemon and harissa sauce (I make mine in my mortar and pestle) by pounding or chopping a clove of garlic to a paste with 1/4 tsp. salt, then stir in 2 Tbsp. each olive oil, lemon juice, and harissa paste; set aside. Roast pepitas in a dry pan over medium heat, stirring often, until toasty and some of the seeds have changed from green to golden. Finally, press a block of tofu and cut it into cubes or dominoes. Pan-fry it in a little oil over medium-high heat. Once you add the tofu to the pan, sprinkle it with salt and then leave it alone until it releases easily from the pan and the underside is golden, then flip the pieces and salt and brown the other side. When the tofu is golden brown, reduce heat and add roasted broccoli, 2 c. cooked rice, a handful of chopped green (or kalamata) olives and a few spoonfuls of drained capers. When everything is warmed through, remove pan from heat, add the lemon-harissa sauce to the pan and toss well. Serve topped with toasted pepitas. 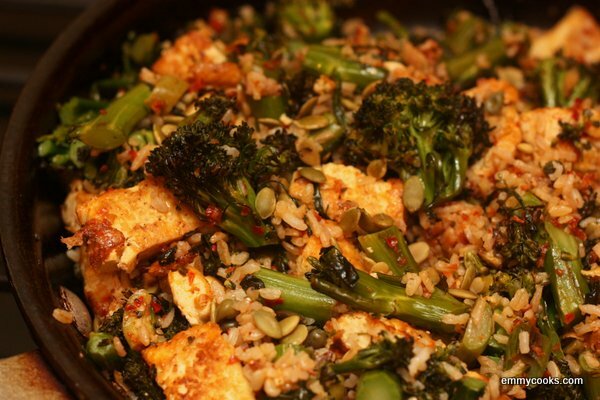 This entry was posted in Emmy Cooks Original, Food, Recipes, Tofu, Vegan or Would-Be-Just-As-Good-Vegan and tagged broccoli, harissa, leftovers, pepitas, rice, Thanksgiving, tofu on November 23, 2012 by emmycooks. Now you’ve gone and gotten me Lottie and Doof crazy. Innocent little visit here http://www.lottieanddoof.com/ and one can spend the next long, long while off on a tangent, or many. That looks so good. Gotta love leftover magic! Did someone say broccoli!? Yum! Got everything! Making tonight;o) thanks, lady. I love this leftover recipe! If you have any thoughts about using up leftover stuffing let me know. I froze it because I couldn’t bear throwing it out. making this again! “last meal” before the cleanse. thank you!